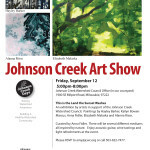 With Marty Urman’s legacy in mind, JCWC is teaming up with local artists for another Johnson Creek Art Show, held at JCWC headquarters. Enjoy several different mediums all inspired by nature. This is the Land the Sunset Washes – An exhibition by artists in support of the Johnson Creek Watershed Council. Paintings by Hayley Barker, Kailyn Bowen Marcus, Anna Fidler, Elizabeth Malaska and Alanna Risse. Enjoy acoustic guitar by musician Steve Cooper, wine and beer and light refreshments at the event.